Home » Posts » The Gamification of Clinical Trials: What’s Next? Can gamification improve clinical trials? Clinical Trials. Games. One of these things is not like the other. How can they possibly go together? Clinical trials are a very serious business. And games are, well, games. Do games really have serious applications? Here’s a quick story. The success of Linkedin, as a social network, hinges on its ability to encourage user profile completion. Individual users will only find value in Linkedin when many other people have completed their profile. Yet unless individual users see value in the network, they are not likely to engage in the unpleasant activity of completing their profile. Before gaining traction, young social networks have to overcome this difficult chicken and egg problem. The phenomenon that I’ve described is known as the network effect. So you see in the earlier days of Linkedin, it was very important that the social network find a way to encourage profile completion. In fact, it was imperative for survival. So how would Linkedin encourage people to complete their profiles? Their solution was simple, inexpensive, and highly effective. In fact, as a result of this solution, profile completion went up 20%. Not too shabby. This Linkedin progress bar is an example of gamification. Feedback about performance – The progress bar tells you how you are performing relative to how you could be performing. Linkedin even provides a suggestion on how you can improve your performance, making the progress bar even more effective. Sense of progression – In the same way that you might “level up” in a game, there is a sense of progression each time you complete a new portion of your profile. Encouragement of completion – Games usually have some kind of completion goal. Linkedin is providing a completion goal and encouraging users to reach it. I first wrote about gamification in pharma and clinical trials back in 2011. In that post I used Boehringer’s Syrum game as an example of gamification in pharma, and potentially, clinical trials. At the time, Syrum was still under development, so the information I had was limited. A European release of Syrum occurred in August of 2012. But as of January 2013, the game has not been released here in the US. Based on the information now available, it appears that my original classification of Syrum as “gamification” was stretching it. Gamification is the use of game design elements and game design techniques to solve non-game problems. So what are some more clear cut examples of gamification in healthcare? I’ll describe a few. And then I’ll hint (hey, I can’t give away all the goods on this blog) at some potential applications of gamification in clinical trials. One of the most visible examples of healthcare gamification is activity trackers that are becoming increasingly popular. I happen to own the Nike Fuelband. Its features, some of which I’ve listed below, are very game-like. With the band and its accompanying software, I can set a daily activity goal. As I go about my day, I earn points that Nike calls NikeFuel. To get feedback on my progression towards goal, I can check the band at any time. Using the FuelBand, I maintain awareness of my activity level, and I’m more empowered to engage in desirable behavior. Activity trackers like the Nike FuelBand help consumers drive behavior changes that improve their health. Because gamification is a powerful behavioral modification tool, it has great potential to create healthy habits. Not surprisingly, health insurance companies are beginning to make investments in gamification for this purpose. Gamification can also be used for serious scientific applications. The online game Foldit is one of the first and most famous examples of gamification in a scientific context. Foldit is a puzzle-like game where players are scored on the structures of the proteins they have folded. What problem does this game solve? It addresses two problems actually. The first problem is protein structure prediction. To understand how a protein works and target it with drugs, you need to know its structure. But the number of ways a protein can fold is astronomical. Figuring out one of the many possible structures is very difficult and requires a lot of resources using current methods. Foldit uses human puzzle-solving ability and competition to attempt to predict the structure of proteins. The second problem is protein design. 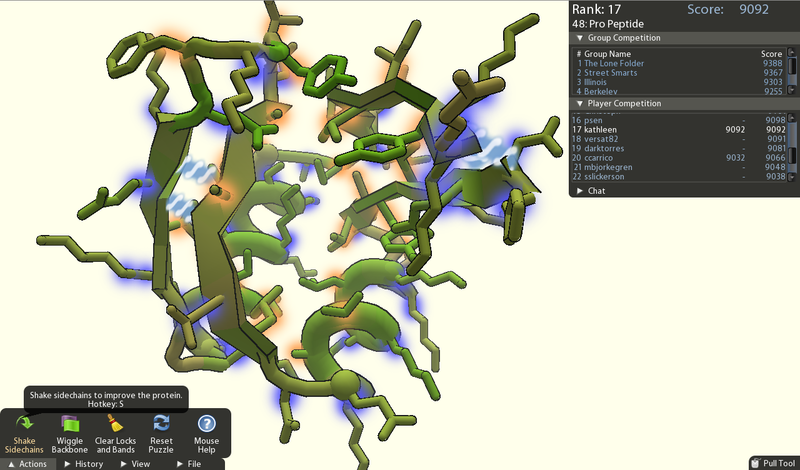 While playing Foldit, players design new proteins that could help to prevent or treat diseases. This screenshot shows the Foldit game in action. Gamification has also shown viable for improving the efficiency of malaria image analysis. It takes about 20 minutes for an expert microsopist to manually count the number of parasites in blood smears through a microscope. To save time, researchers devised a game for online volunteers to detect parasites in digitized blood sample images. In one month players from 95 countries played over 12,000 games and generated a database of over 270,000 clicks on the images. Researchers found that combining 22 games from players yielded parasite counting accuracy of above 99%. How awesome is that? Pretty awesome I’d say. Both of the previous two examples, by the way, also fall under the definition of crowdsourcing, another fascinating possibility for advancing clinical trials. Interestingly, the FDA recently approved the first clinical trial protocol designed through crowdsourcing (but that’s a topic for another day). To date examples of gamification in clinical trials are few and far between (if you know of any, get in touch with me). So here’s a couple of potential applications to spur your imagination. Because humans are creatures of habit, new habits are difficult to create. Yet to participate in clinical trials, that’s exactly what subjects must do. For example, subjects might need to take an investigational medication or complete a diary. The ability of patients to form habits around clinical trial protocol requirements is what we refer to as patient compliance. And lack of compliance is the source of all sorts of negative consequences in clinical trials. Thus, subject habit creation is essential to the overall success of clinical trials. Gamification, as a behavioral modification tool, can help subjects create new habits that improve patient compliance. Think about the activity tracker example described previously. Use of these trackers creates awareness and empowers users to change behavior. This same principle can be applied in the context of patient compliance. However, an important caveat must be noted. To use gamification effectively and ethically in this context, subjects must want to change their behavior. If a patient has mixed feelings about your clinical trial because he/she finds an adverse event intolerable, for instance, gamification is not your solution. In response to the challenges of drug development, a movement towards greater innovation and collaboration seems to be afoot. For example, last year some of the biggest biopharma companies created a collaborative non-profit called TransCelerate BioPharma. Whether Transcelerate or other efforts spur meaningful innovation and collaboration remains to be seen however. Just as individuals are creatures of habit, organizations and industries are too. Pharma culture, perspectives, and processes are essentially habits, and those habits have become quite engrained over the last several decades. Some habits are positive, like processes that promote efficiency for instance. But other habits are preventing us from evolving with the changing landscape. Gamification can be used to promote and incentivize new habits, both within companies and industries. In the context of clinical trials, for example, game thinking could inspire new mechanisms to encourage innovation and collaboration. Think that’s crazy talk? Gamification is already being used in other industries to promote innovation and collaboration. And the practice is hardly fringe. Last year Microsoft bought Yammer, a gamified enterprise social network, for $1.2B. Meanwhile, Gartner says that by 2015, more than 50% of organizations that manage innovation processes will gamify those processes. As you can tell from the tone of this post, I think gamification is a fascinating trend with much potential. My primary gripe with gamification is that we’ll soon see many people jumping on the gamification buzzword bandwagon. As that happens, it will get more difficult to separate signal from noise. Like with any hot trend, whether it be social media or gamification, keep your critical thinking caps firmly on your head. What do you think about gamification? Put your thoughts in the comments below. This is a great article. I’ve actually considered trying to incorporate some sort of gamification initiative at our site but couldn’t quite connect research to…well, games. I can see how this would definitely work with patient retention but any examples of how it worked with patient recruitment? Examples of gamification in clinical trials are relatively sparse. I think there is potential in patient recruitment, but if applied with a heavy hand, it could certainly backfire. I would certainly spend some time studying up on gamification before using it in that context.